There is something cruel and unusual about tiny needles. This might sound strange coming from me since they are both my constant companions and a vital component of making the things that I often make. But somehow it's different when one is working something like a scarf; when one is going for length; when one just wants to shout "Oh my crap, get on with it already. GROW." Still, one can not argue with the overall effect that working with tiny needles affords. Adding tiny repetitive patterns and fine yarn to the mix just heightens it. I had forgotten how enjoyable lace knitting can be. And speaking of forgetting things, it seems that I had also forgotten that patience is a prerequisite when it comes to knitting. I'm trying to remember. As my teacher is fond of saying, "It's the process, not the product"...though I, too, have trouble remembering that! December 14, 2010 at 5:32 p.m. I am cracking up: "Oh my crap, get on with it already. GROW." I can't tell you how many times I have said that. It's the black hole of knitting! December 14, 2010 at 7:53 p.m. 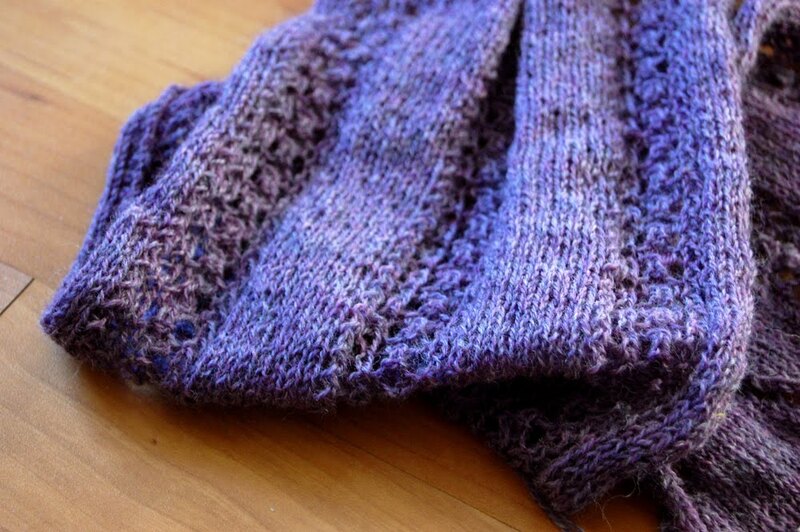 I just forwarded your blog entry to a friend who has been struggling to find a pattern for her fine yarn. I also sent a link to The Flutter Scarf on Ravelry. I'm pretty sure that is the pattern you used. December 15, 2010 at 9:34 a.m.
Kelley -- Thank you! Yes, that's the one. It's a lovely and easily memorized pattern. December 15, 2010 at 10:13 a.m.
Kathy -- I had been happily Black Hole-free until the last couple of projects. Now it gets me every time. It is both strange and hilarious. December 15, 2010 at 10:14 a.m.
Tamara -- I am quite fond of the process itself. I just have never experienced so much of it in such larger amounts. December 15, 2010 at 10:15 a.m.